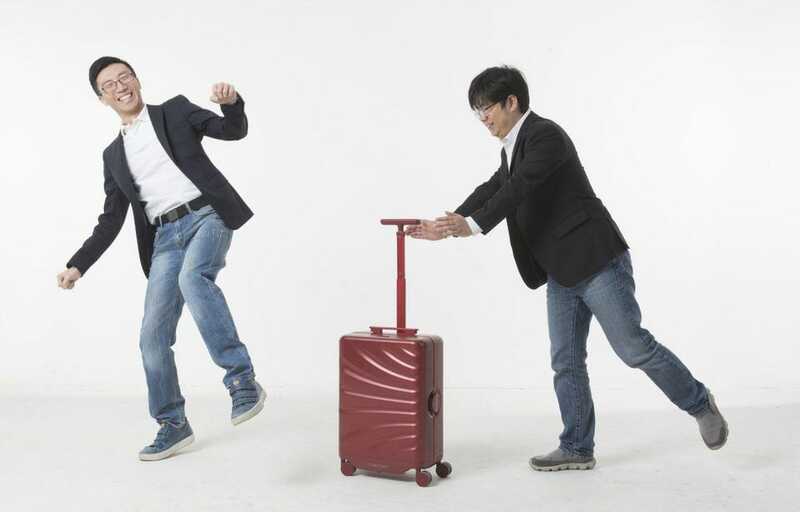 Liyuan Liu and Liao Wenlong, cofounders of COWAROBOT with the Rover suitcase. Want a smart suitcase that can automatically follow you around? Or an underwater robot that can snap photos of you swimming? What about a portable Wi-Fi that can get you connected wherever you travel? This year, several young entrepreneurs making Forbes 30 Under 30 Asia list are turning these cool tech ideas into a reality, achieving their early success by bringing high-tech gadgets to consumers across the region. In China, Liu Liyuan, Liao Wenlong and Tommie He Tao (who at 35 missed the cutoff for the 30 Under 30 list) had been aiming to develop autonomous cars at COWAROBOT, the Shanghai-based startup they cofounded in 2015. While they’re still figuring out that technology, they’re forging ahead with basic self-driving technologies to create other products they can market now. Their innovations so far have helped them raise $50 million in funding from investors, including Japanese billionaire Masayoshi Son’s Softbank and Beijing-based China Creation Ventures. One product that caught investors’ eyes was COWAROBOT’s Rover suitcase, which can automatically follow its owner around, avoiding obstacles it encounters. With each Rover suitcase priced at $800 in China and $899 in other markets, COWAROBOT managed to sell 12,000 last year. The company has also developed self-driving street cleaners and delivery vans. COWAROBOT has already deployed 50 such trucks in the Chinese cities of Changsha, Chengdu and Wuhu. Meanwhile, Zhang Daoning, Zhang Jianing and Xu Chen are working to make virtual reality technologies more accessible to mass market consumers. Founded in 2015 in Beijing, NOLO VR is best known for its $200 NOLO CV1 toolkit. It comes with two handheld controllers and a wearable tracker, which are embedded with 6DoF interaction technologies. Such technologies track objects at more degrees, enabling a more immersive VR experience where users can interact with their surroundings. By wearing the NOLO CV1 gadgets, consumers can get an experience that is comparable to the more expensive Oculus Rift ($349) and HTC Vive ($499). Last year, NOLO VR raised $10 million in its series A round of financing led by BlueRun Ventures. Another cool tech idea from China is Xiong Minglei’s ROBOSEA. Founded also in 2015, the Beijing-based robotics startup seeks to differentiate itself by focusing on underwater scenarios. Its fish-shaped robot, called BIKI, has a two-hour battery life and sports a 1,600-pixel camera for underwater photography, a consumer-oriented product that has helped the company become profitable. ROBOSEA is also catering to more professional markets: The company’s Robo-Shark model is equipped with autonomous navigating systems and can help to map underwater environments, while the Robo-Run model is an amphibious device that can detect flaws in both underwater and underground pipelines through a high-precision sensor and mapping system. To date, ROBOSEA claims to have raised more than 100 million yuan ($15 million) in venture capital funding, with the latest round in June 2018 from China’s Lianshi Capital and 1898 VC. Outside China, India is another country where innovative gadgets are increasingly taking hold. For instance, Bangalore-based Ethereal Machines, a startup founded by Kaushik Mudda and Navin Jain,develops 5D printers. The Ethereal Halo differs from traditional 3D printers by adding two axes to enable the printing of more complicated shapes. Thanks to a revamped design that the founders claim can make the device a lot more portable and sell at about $22,000, which is about one-third of the price of similar devices, the startup won the Best of Innovation Award at 2018’s Consumer Electronics Show in Las Vegas. Another Indian company, Eventuate Innovation is using technology to solve an urgent social problem on hygiene in the world’s second most-populous country. EzySpit, the brain child of cofounders Prateek Malhotra, Pratik Harde and Ritu Malhotra, is a portable spittoon that claims to be able to solidify and disinfect spit in 10 seconds, thus helping to address the public health concerns caused by public spitting across India. So far, the Mumbai-based startup is selling the product through partnerships with the municipal corporations of the Indian cities of Nagpur and Indore, as well as with the Fortis Hospitals. Last but not least is Kazakhstan, home to another cool tech idea by local startup Nommi that appeared on this year’s list. Founded by Alyona Tkachenko, Nommi makes mobile broadband internet routers that run on eSim and can provide fast 4G hotspot access in over 100 countries, saving users from purchasing data plans when they travel overseas. The device also serves as a power bank and a wireless mobile charger. It is one of the most successfully crowdfunded projects in Kazakhstan, followed up by a $435,000 seed round in December 2018 with a $142,000 crowdfunding campaign on Indiegogo..